The kenotaph in Limyra was built for Gajus Caesar, the grandson and designed successor of Augustus, who died here in 4 A.D. when returning from a mission in Armenia. 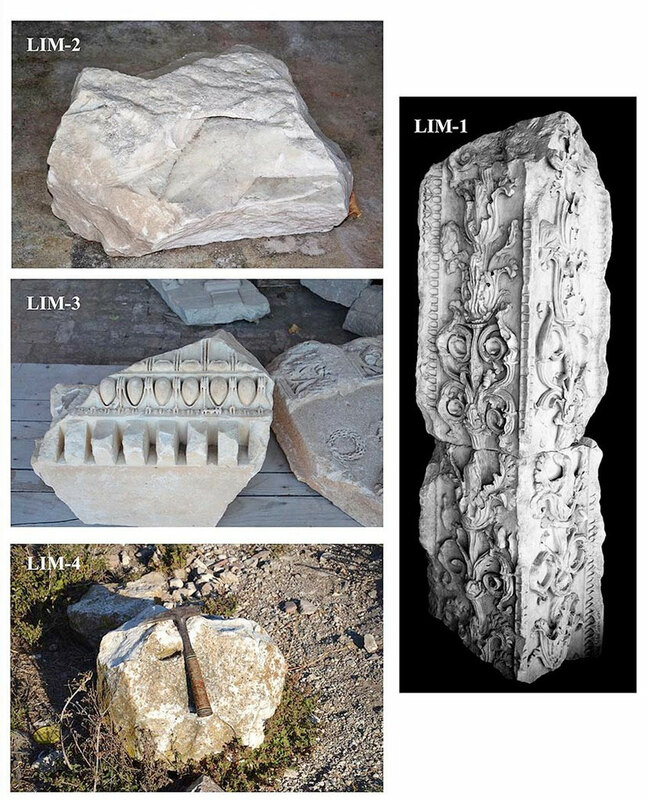 The today´s relics of the monument consist basically of the solid core of the building (made of opus caementitium) and a few findings of the marble frieze and other parts of decorative architecture. The solid core of the kenotaph in Limyra. During the campaign in 2013 we could acquire four samples of this marble. All parts are of white, medium grained, high-quality marble. Under the microscope no impurities of silicate minerals could be detected. 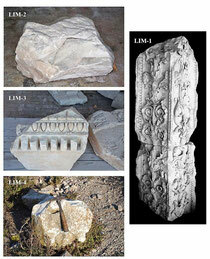 In general the petrographic characteristics very much resemble those of the marbles from the quarries in Aphrodisias. 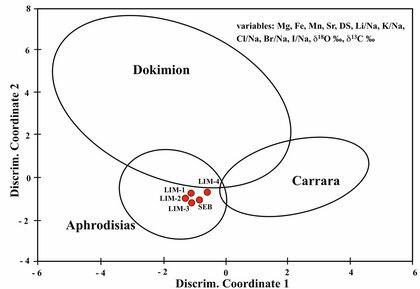 The chemical and isotopic composition of the four marble samples clearly show that the marbles originate from the Aphrodisias quarries. 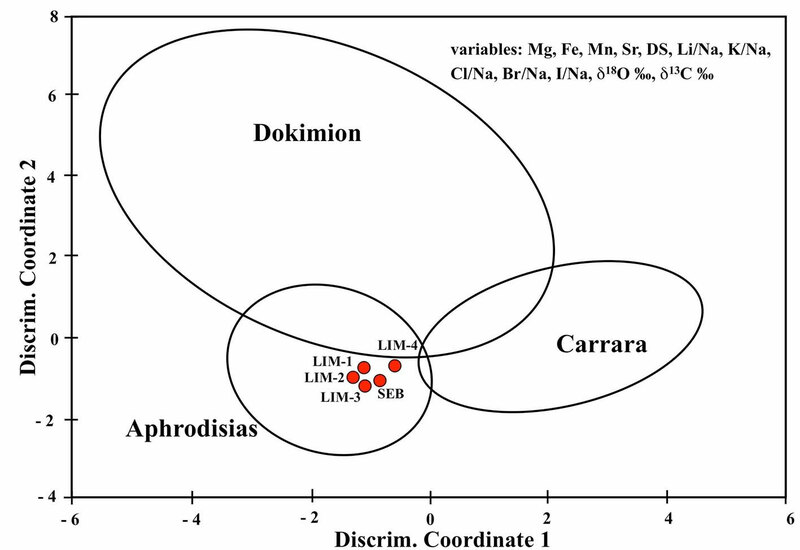 One sample from the Sebasteion (SEB) of Aphrodisias is also displayed in the diagram for comparison. The multivariate discrimination clearly assigns the marbels from the kenotaph to the quarries of Aphrodisias. Exhibiting western iconography and eastern style the kenotaph in Limyra is a convincing example how an iconographic master plan dictated from Rome and the arising empire was executed by asiatic - not neccessarily Aphrodisian - craftsmen who used their familiar material. No contemporary similar architecture is known in this region, so we can assume that asiatic travelling masters (Aphrodisias?, Ephesos?) 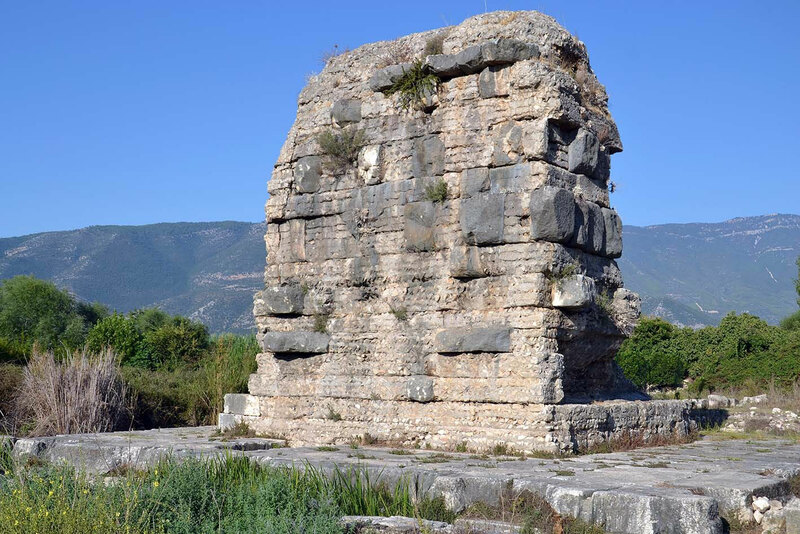 executed this monument transporting the marble from Aphrodisias to Limyra either by land across a difficult route or across the usual route to the west (Ephesos) and then further via sea route.